A storytelling visit with Vicky Town is dynamic, high energy, and a great fit for summer reading programs, National Book Week, Read Across America, Halloween, and other holidays .... or any event you create! Vicky connects with all ages and quickly has them participating from their seats or getting up to act the last story of the program! • Created a traveling storytelling troupe for grade school and middle school students. • Facilitated Prime Time Family Reading Time through Louisiana Endowment for Humanities in multiple libraries in PA. This is a national program for low income and low literacy families with an emphasis on reading, storytelling, and discussion. 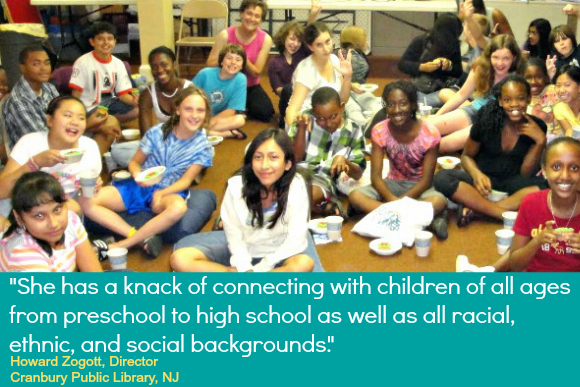 • Facilitated Library Services Tech Act taught after school, comedy improvisation classes to at-risk middle and high school students in multiple libraries culminating in neighborhood performances. • Coached adults for Spellbinders, a national organization which encourages storytelling in the community. • Facilitated Memoir Writing Workshops in which young adults and seniors learned to retrieve , remember, organize, and tell their personal stories.